Sarah Nader- snader@shawmedia.com Dundee-Crown's Christian Brunner (top) wrestles Huntley's Petros Mihalopoulos at 195 during the finals at Saturday's Fox Valley Conference wrestling meet at Hampshire High School January 30, 2016. Sarah Nader- snader@shawmedia.com Dundee-Crown's Christian Brunner (back) wrestles Huntley's Petros Mihalopoulos at 195 during the finals at Saturday's Fox Valley Conference wrestling meet at Hampshire High School January 30, 2016. Sarah Nader- snader@shawmedia.com Jacobs' Jake Golnick (left) wrestles Crystal Lake Central's Austin Parks at 220 during the finals at Saturday's Fox Valley Conference wrestling meet at Hampshire High School January 30, 2016. Sarah Nader- snader@shawmedia.com Jacobs' Jake Golnick wrestles Crystal Lake Central's Austin Parks at 220 during the finals at Saturday's Fox Valley Conference wrestling meet at Hampshire High School January 30, 2016. 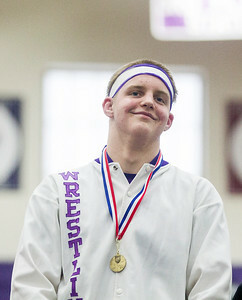 Sarah Nader- snader@shawmedia.com Hampshire's Wylie Allen gets his first place medal at Saturday's Fox Valley Conference wrestling meet at Hampshire High School January 30, 2016. Sarah Nader- snader@shawmedia.com Prairie Ridge's Derek Pearson (left) wrestles Huntley's Dominic Swanson at 285 during the finals at Saturday's Fox Valley Conference wrestling meet at Hampshire High School January 30, 2016. Sarah Nader- snader@shawmedia.com Jacobs head wrestling coach Gary Conrad during Saturday's Fox Valley Conference wrestling meet at Hampshire High School January 30, 2016. 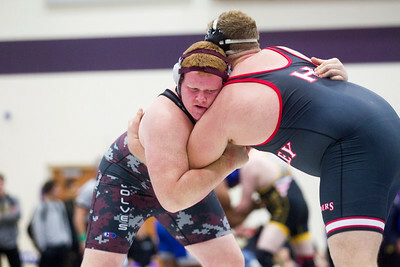 Prairie Ridge's Derek Pearson (left) wrestles Huntley's Dominic Swanson at 285 during the finals at Saturday's Fox Valley Conference wrestling meet at Hampshire High School January 30, 2016.